Updated Sunday July 29, 2018 by Glen Pettigano. Right after the war, many semi-professional football teams began to establish themselves all over North Jersey. At that time in 1947, East Paterson had their Red and White Eagles starting up. Some of the young men who played on the team were Jim LaPorte and Jack McVeigh. They were just doing what many working class towns did…they played sports, particularly football. In 1958, Mr. LaPorte was approached by several youths who wanted to play football in an organized league. So people like Scotty Beckett, Pete Ciolino, Lou Nicosia, and Jim Pantano joined in to form the East Paterson Bomber Football Association. 1959, These men purchased equipment from a local sporting goods store to suit up the first Bomber team. The Bombers first game was played at East Paterson High School against Paramus at home. The Bombers anticipated a large crowd in hopes to pay off all the equipment. Luckily, it was a great success. The Bombers beat Paramus that first night and continued being a top-notch organization. They had the best equipment and the best coaches with Mr. LaPorte as the first Bomber coach. It was only a couple years later that Dr. Varallo formed the first pee-wee team. Dr. Varallo had a soft spot for the kids that were a little less than great. Unfortunately, he was taken from us too soon. The Bombers now became a pool of well-coached and motivated youths who aspired to play football for the East Paterson Crusaders. As the decades went on, unfortunately, with the aggressive recruiting of private schools, the East Paterson/ Elmwood Park Memorial High school football team lost out on many of the great athletes who were born and raised in EP and who had gone through the Bomber program. In 1972, volunteers and donations had built the existing “Bomber Hut” located on the Boulevard. The “Hut” got its name, however, from when the Bombers had to store all their equipment at Scotty Beckett’s home that was located at Boro Field where the Recreation center is now. It was the original “Hut”. If you grew up in East Paterson/Elmwood Park, being a Bomber has a special kind of meaning. It doesn’t matter whether you were a football player, cheerleader, parent, coach, or even just a fan, you know that there is nothing more EP than the Bombers. Just to mention some individuals who have gone through the Bomber Organization; George Galler, All-State for East Paterson Memorial High School in 1964; Bob Thornton, captain at Temple University 1971 and went on to the NFL; and Rich Rosen, played at Syracuse and drafted by the Dallas Cowboys. Others include All-State Bob Nagle who played fullback at Penn State and was lead blocker for The Heisman-winning tailback John Cappelletti; All-State Tony Zappala who started at defensive end all 4 years at Notre Dame, helping them to win a national championship; and All-State Tim Brock who went on to play for Duke. 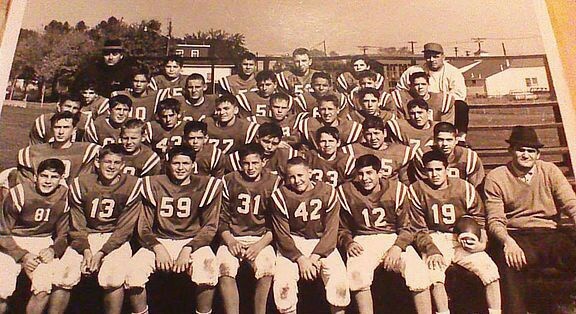 Note: The picture above is a team photo of the East Paterson Bombers taken circa Fall of 1962.